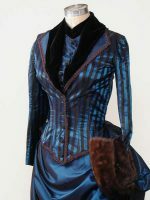 Blue/Black striped bodice with velvet trim and tails, worn over a draped bustle skirt. 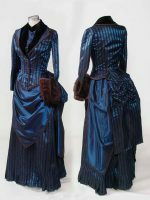 Underneath is a bustle pad and petticoat with ruffles down the back. Design from Butterick catalog.